Third Wave techno artist Kenny Larkin is the member of a new school of Detroit-based musicians taking the city's famous brand of hard-edged musical futurism into new and innovative areas. Although he missed out on the style's formative years in the mid- to late '80s due to a stint in the military, Larkin, a Detroit native, was brought up to speed upon his return by the likes of Juan Atkins and Derrick May, the latter of whose weekly radio shows inspired Larkin to pursue music production. 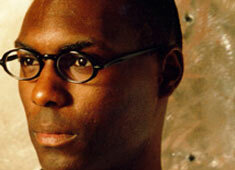 Heavily rooted in house, Larkin quickly incorporated techno's formal characteristics into a brazen-yet-refined style that places his music somewhere in between Detroit and Chicago, combining house's more swinging rhythmic vibe and soft edge with techno's muscular backbeat and experimental zeal. He released a pair of 12-inches -- "We Shall Overcome" and "Integration" -- on the Richie Hawtin/John Acquaviva label Plus 8 in the early '90s before moving on to release material through Buzz, Warp, and R&S. Massively influential on British and German, as well as American strains of techno, his tracks have appeared on a number of notable compilations documenting new-school Detroit talent. His exposure abroad has also translated, as with a number of Detroit originals such as Jeff Mills and Carl Craig, into a level of European success far surpassing that at home. Somewhat suprisingly, he took several years off from production work in the late '90s and early 2000s to focus on his alternate career as a standup comic. Though he continued to DJ during this period, it wasn't until 2004 that he released new material for England's Peacefrog label.